Congrats for your award...njoy it:)) curd rice looks tasty and yummy...i love it..
Conratulations! Its nice to know a little about you:) The curd rice looks tempting and the addition of raw-mango is a great idea. Congrats! New follower of your blog. I am thinking of sending an entry for your event! Congrats on your award.Simple and easy recipe. Looks delicious. 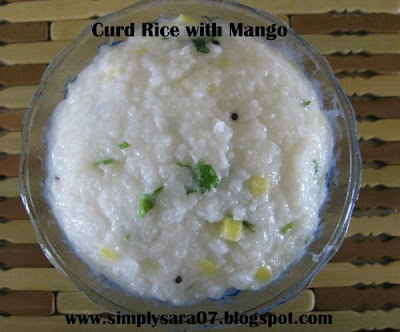 Congrats on ur award, curd rice looks fantabulous with those mango chunks.. The mango thayir sadam looks so good..Must have for the summer. Congrats on the award Sara. Wishing you many more awards. this curd rice is very new saras! !...usually will try with carrot!! congarts..wow, what nice use of raw mango in the curd rice..
Congrats. Mango and Curd rice a great combination. thanks so much for this wonderful award!! Congrats on ur Award sara ...Mango and Curd rice great combo .. thanks a lot for passing award to me ..
Congrats for your award, and tanks a zillion for sharing the same with me! It did made my day...as its my first award:) Mango in curd rice is something new to me..will try it out!